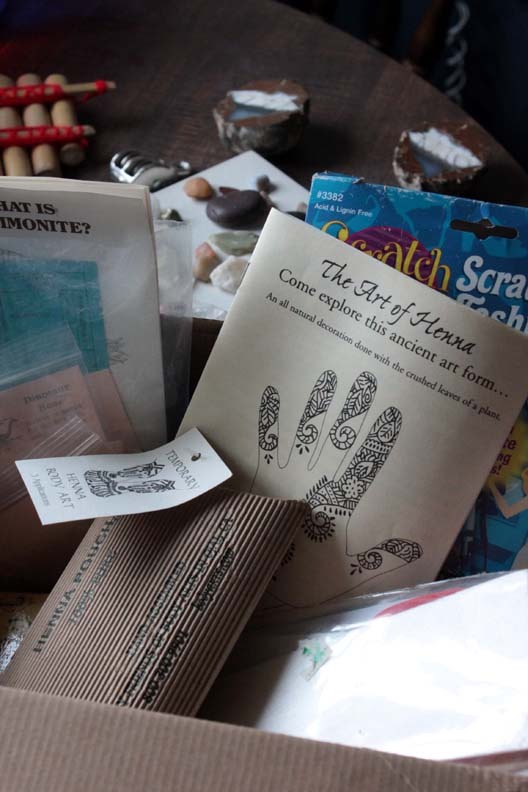 Yesterday we received a box in the mail.... a box of goodlies from the lovely Jen and Evie at Circle the World in Big. I'm sure I don't have to tell you how excited we were. :) Jen wanted to send us a few a few Magic School Bus dvd's, and thought she'd brighten us up with a few other things, too. Wanna know what a box of Juice looks like from one unschooling family to another? Oh, Jen and Evie. Thank you so much! We love all of them! Maddie watched Haunted House (which is about sound, and sound waves) all day yesterday. Naturally, since we were immersed in sound vibrations, we just had to start on that pan flute. So we read the little paper from Chile, and learned a bit about Chile and that the pan flute (anciently known as the syrinx) is thought to be the oldest and most widely-distributed instruments of all instruments. 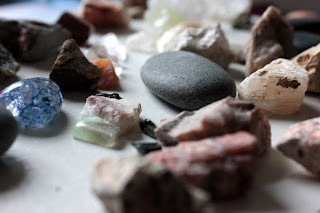 A rock shop was opened with the loose stones and minerals that were sent to us. Madd had abandoned her shop for a few minutes, and Annabelle stumbled over her store display, and up jumps Maddie, "Oh! My first customer!!" :) Made me laugh. and lots of hmming and idea gathering and novel-reading and lying about for me. What a lovely box of goodies!! Looks like a ton of fun.